The next big one to tip over into decline will be Saudi Arabia. And, if you have been following this series, then you will understand the basis on which I make the observation that this is, in fact, incorrect. The site uses a plot by Euan (without the link) from back in 2007, though it is credited to 2008. Figure 1, Euan’s production estimates from 2007. One of the reasons that I am writing the current OGPSS series is to see how the earlier estimates that we made “back when” are playing out, and, for reasons I have explained both in earlier posts and below, Saudi Arabia is likely still a couple of years away from peaking. No, (to finish the opening thought) the major player who will tip over first is much more likely to be Russia (of which I have written earlier) than the Kingdom of Saudi Arabia (KSA). Very simply Russian producers will likely soon yield back global production leadership to the KSA, (though presently still slightly ahead) and further, since they run on maximizing current production, rather than overall field yield, they are not doing the necessary steps to sustain future production which is a growing characteristic of the KSA operations. There are a number of different examples to illustrate this, as I have documented earlier. In addition the KSA seems increasingly interested in developing the enhanced oil recovery (EOR) techniques that have helped other fields in the latter stages of their lives. As Aramco note, as the price of oil has risen, so the economic viability of EOR technologies covers a greater range of options. 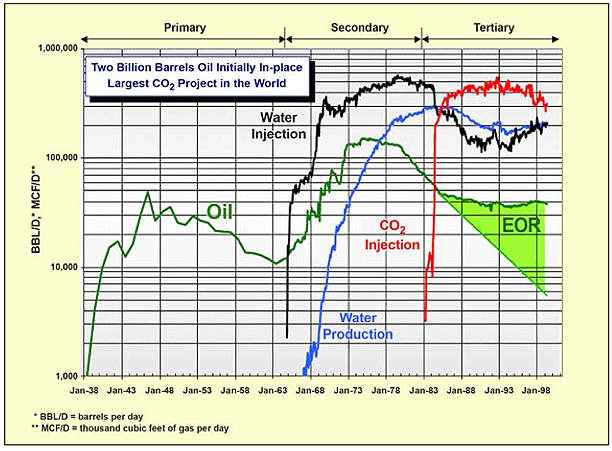 Traditional CO2 injection, for example, can enhance overall field production by perhaps 18% or more. In WAG injection, water/CO2 injection ratios have ranged from 0.5 to 4.0 volumes of water per volume of CO2 at reservoir conditions. The sizes of the alternate slugs range from 0.1 percent to 2 percent of the reservoir pore volume. Cumulative injected CO2 volumes vary, but typically range between 15 and 30 percent of the hydrocarbon pore volume of the reservoir. 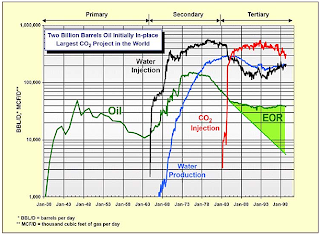 Historically, the focus in CO2 enhanced oil recovery is to minimize the amount of CO2 that must be injected per incremental barrel of oil recovered, especially since CO2 injection is expensive. However, if carbon sequestration becomes a driver for CO2 EOR projects, the economics may begin to favor injecting larger volumes of CO2 per barrel of oil recovered, i.e., if the cost of the CO2 is low enough. And how effective can it be? Consider this plot of production gains in the Wasson field in West Texas. Note that the DOE reported that in 2008 the industry was injecting 1.6 bcfd (billion cubic ft/day) into Permian Basin fields to produce 170 kbd of oil. 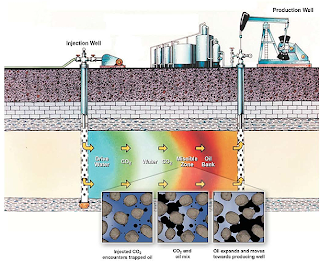 It is worth noting that the KSA initial site is being set up to inject 40 mcf/d (million cubic ft/day) some 2.5% of the US volume, into 7 wells in the initial pilot project, in Uthmaniyah so that the initial gain in KSA production may well be quite small, but there are additional CO2 sources in country which, should the pilot show to the gains potentially possible, can be tapped and which could significantly change the overall ultimate recovery of oil from Ghawar (and others). 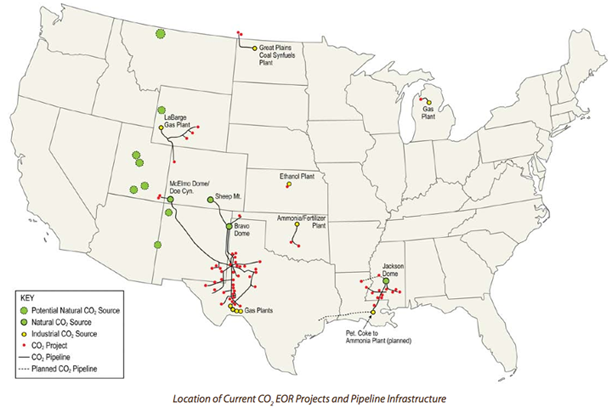 Further there is ongoing research into enhancing the performance of CO2 in EOR, that will likely pay off in the medium term. • It can be applied during the early life cycle of the reservoir, unlike EOR. • The payback is faster, even with small incremental oil recovery. A BP study (Lager, A., Webb, K.J. and Black, J.J.: “Impact of Brine Chemistry on Oil Recovery,” Paper A24, presented at the EAGE IOR Symposium, Cairo, Egypt, April 22-24, 2007. Also Strand, S., Austad, T., Puntervold, T., Høgnesen, E.J., Olsen. M. and Barstad, S.M. : “Smart Water for Oil Recovery from Fractured Limestone: A Preliminary Study,”) showed the following incremental gains over conventional water flooding. Figure 7. 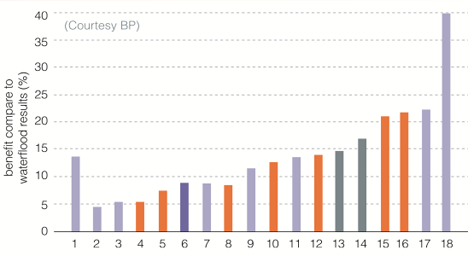 Gains achieved by BP in changing salinity in recovery from different fields (Saudi Aramco ). The current areas of investigation have extended into dealing with the tar mats that are present in parts of Ghawar. Current research is aimed at extending wormholes into the formation, through which it will be possible to pass different EOR treatments in order to further improve the extraction rate from the field. When these current projects, in their various stages, are combined with the future production from Manifa, and enhanced production from Safaniyah, I expect that the Kingdom will continue to produce at around 10 mbd for at least a few years more, though I continue to doubt that it will be able to increase much beyond that. After all, even when field declines are held to 2% a year, after 50 years the arithmetic starts to take an increasing toll – Ghawar began production in 1951. And so, with respect, I disagree with David Archibald, if only in the short term - but for those of you with a few minutes, the comments that follow his post at WUWT are quite entertaining. 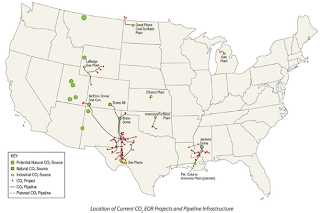 Enhanced Oil Recovery is a complex topic. Things which are technically feasible may be economically infeasible. For example, fresh (low salinity) water flooding (your Figure 7) has indeed been shown to yield incremental recovery compared to sea water injection; but where does Saudi Arabia find a massive source of fresh water in the desert? And if Saudi can create a massive source of fresh water at high cost, would the economic return from using that fresh water in EOR be more attractive than from (say) using it in agriculture? A further issue is the competition between EOR and exploration, where the risk-averse nature of National Oil Companies may cause a bias against exploration. An interesting example of the continuing potential for exploration is the 2010 discovery of the major Johan Sverdrup field in what looked to be a thoroughly-explored mature area of the central North Sea -- by a minor Swedish oil company. Exploration wells are clear-cut successes or failures. And exploration failures can be career limiting moves for individuals in National Oil Companies. In contrast, the results of EOR programs are usually not clear cut, since it may be very difficult to assess what the recovery would have been under a different recovery mechanism. Consequently, National Oil Companies may tend to favor EOR over exploration. However, it is likely that there are "Johan Sverdrups" still waiting to be discovered in Saudi, which will eventually be found and will rewrite the conventional Oil Drum playbook. The bigger issue (for major oil importers such as the European Union, Japan, & China) is likely to be the increasing tendency of Saudi Arabia to use its oil internally, and therefore export less. 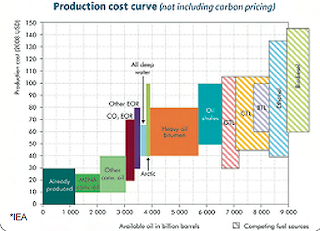 The EU, in particular, is reinforcing this trend in Saudi with its existing high taxes on oil and its Quixotic war on the demon Carbon Dioxide. While future exploration will likely find more fields in KSA, and they have yet to develop all the ones they have found, they are moving to produce smaller and smaller fields as the really big ones start to run out. It is in those fields where the potential benefits from EOR would yield the millions of barrels that justify the investment in research, at least in my eyes. HO -- Just to be clear, I am all in favor of expanded research into EOR. 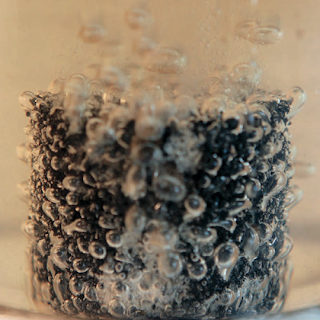 Human beings still have a long way to go to understand the forces which keep microscopic globules of hydrocarbons trapped within interconnected pores. Better understanding may lead to higher economic recovery from known fields. Unfortunately, the actions of Western governments have largely gutted real research by Western oil companies and government research institutions. And most university research these days seems to focus on cheap mathematical modeling (the same limited approach which gave us the flawed hypothesis of Anthropogenic Global Warming). 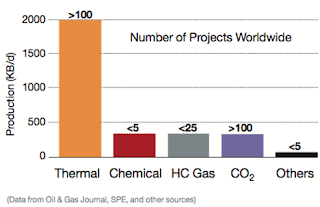 This means the hope for breakthroughs in EOR research has to lie with National Oil Companies. Fortunately, Saudi Aramco seems to be rising to that challenge. Let's hope it inspires other National Oil Companies to do the same.